Japanese Episode AG 033: "Haruka ni Raibaru! Tokkun Pokemon Kontesuto!!" American Episode 305: "Now That's Flower Power"
Now that the gang is in Kaina City, Haruka has two weeks to train for her upcoming contest. She starts off by trying to teach her Agehanto to master its Silver Wind attack, but no matter how many times it tries the pokemon is unable to successfully pull it off. While training, she comes across a Coordinator named Shuu who teases Haruka's lack of experience. Haruka is determined to beat Shuu, so she continues training her Agehanto. During this time, a fireworks maker named Hanabi approaches the group and compliments Haruka's technique. Hanabi decides to give Haruka a Berry with which to make a Polock, but when he checks his warehouse, he finds that Haruka's Achamo had eaten all of his Burii no Mi! He needs those Berries to incorporate into his fireworks, so Haruka decides to find one for him. During the search, Haruka comes across Shuu, so the two decide to have a mock contest battle. The battle is interrupted by the Rocket-Dan, who steal the Berry that Haruka had managed to find! Shuu steps in with his Roselia to stop the trio and retrieves the Berry. Now, Hanabi can complete his fireworks! As the trainers watch Hanabi's firework show that night, Haruka is determined to defeat Shuu in the upcoming Pokemon Contest. 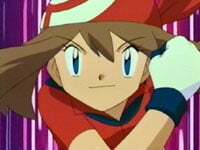 One unique difference between Gym Battles and Pokemon Contests is that Gym Battles can pretty much occur at any time, while Pokemon Contests are scheduled events that require its participants to be at a certain place at a certain time. So when Haruka arrives in Kaina City and finds out that she has two weeks to train for the upcoming contest, I was expecting to have to sit through a huge amount of fillers before we get to the actual contest. As it turns out, that isn't the case, since we only have one episode between this one and the actual contest episode. Not bad at all. While the majority of this episode felt like a waste to me (was the Hanabi subplot really necessary? ), it did give us Haruka's rival for the rest of the series--Shuu. At first glance, Shuu just seems like a Shigeru clone (especially in the dub, where he sounds very similar to Gary) but over time we get to see the character stray from this initial first impression. Edit-wise, this episode is exceptionally boring. I'm not complaining, though. Roselia keeps its Japanese voice, which makes it the first Houen pokemon to keep its Japanese voice (I'm not counting Habunake here). Awesome. This episode was nothing but time cuts. Two seconds were cut from the very first shot of the episode. Two more seconds were cut from the scene after the final commercial break of the episode. And finally, a second was cut from the TO BE CONTINUED... screen.